No no, please do go. I loved you, you hurt my pride. That's fine; I hate you. I could be wrong, but I suspect that "Don't Think Twice, It's Alright" is one of Bob Dylan's most enduring, timeless favorites. It's too bad for me that I don't like it very much. It's undoubtedly brilliant and scabrous, and I can see how lots of people would like a kiss-off song like this because they probably can apply it to more than one romantic finale in their lives. After nearly 30 years of repeated exposure to less-than-perfect endings to relationships, I feel like I'm all out of angry. Maybe it's a great song and I just think it's too mean because I've gone soft. I don't know. The line that bugs me is, "I ain't sayin' you treated me unkind, You could have done better but I don't mind, You just kinda wasted my precious time, but don't think twice, it's all right." That's like complaining that your lie-flat bed in the first-class section of the airplane didn't spray a delicate mist of attar of roses on you while you slept. Moreover, it implies that the trouble in the relationship came from one side only. And though I try to avoid the biographical inspirations of Dylan's songs and just focus on the text, I know that the likely inspiration for this song was ex-girlfriend Suze Rotolo. Whatever their private lives were like, it looks like a case of dirty laundry. Anyway, as Leonard Cohen said, "read me the list of the crimes that are mine, I will ask for the mercy that you love to decline:"
- You're the reason I'm traveling on, even as your rooster crows at the break of dawn. - Your light won't reach me because I'm on the dark side of the road. - Couldn't you possibly do or say something to make me change my mind? Didn't think so. - We never talked much to begin with. - I thought I loved a woman, but I guess she was a child. - I offered heart. She wanted soul. Editors! Following are two versions of the song. 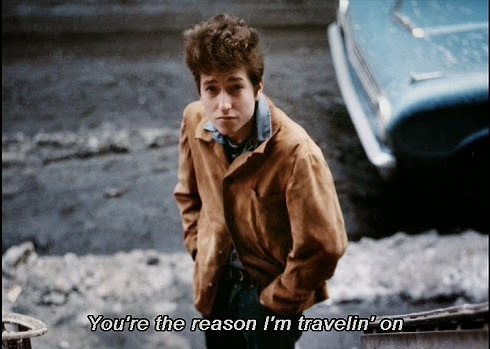 One is the original from 1963's "The Freewheelin' Bob Dylan." The other is a strange reggae adaptation from the 1979 live album "Bob Dylan at Budokan." Thanks for posting this article which adds to the lexicon of Bob Dylan related material. When you have read enough go to the source... The music which is inside his Music Box http://thebobdylanproject.com/Song/id/161/Don't-Think-Twice,-It's-All-Right and listen to what has made all this possible. Join us inside and listen.